The PT-20 Portable Data Terminal (PDT) is a high performance wireless handheld mobile data capture device that scans and stores bar code data for upload to computer. 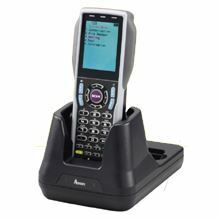 The compact, industrial strength PT-20 features a superior scanner, large 4MB RAM and 8MB ROM memory, a color display, and a bold exterior design.Its Bluetooth wireless capabilities can communicate with peripheral devices within 30 meters. The PT-20 also supports RS-232 for transmitting data to a variety of devices, as well as USB for high speed transmission. Ideal for intensive commercial uses, the PT-20 is shockproof, dustproof, and waterproof in compliance with IP54. The ergonomic, professional keypad and pistol grip are made of wear-resistant rubber and are comfortable to operate. For dark environments the keypad uses a white backlight, and the PT-20 also vibrates for scanning confirmation in noisy or noise-sensitive environments. A 2.4-inch color LCD screen supports 12-, 16- and 24-dot fonts as well as multiple languages. The PT-20 offers tough connections via Pogo Pin and Cradle and high quality cable connections, so broken connections are not an issue. Rechargeable standard and pistol grip batteries provide extended battery life for longer scanning operation. Accessories include single cradle, four-slot cradle, holster with belt loop, charging and communication cable.